A new pumped storage scheme for emergency electricity generation is to take shape in North Wales’s Snowdonia National Park. The SPH development team explain the thinking and the engineering behind the project. With the highest mountain in Wales as its centerpiece, Snowdonia’s natural beauty is a magnet for some six million visitors a year. The same glaciated geology that helps make Snowdonia so valued as a wild place also makes it attractive as a location for grid-scale electricity storage. Dinorwig, currently Britain’s largest pumped storage scheme at 1.7GW, was built there on the northern shore of Llyn Padarn near the town of Llanberis. But that was 30 years ago. It seems astonishing to many involved in the energy sector that despite Britain’s dash for wind and solar, with all that their intermittency implies for grid instability and wasteful constraint arrangements, that three decades should have passed without the creation of further grid-scale storage. Yet that is indeed Britain’s record. While other countries were building storage to mitigate the grid instability caused by intermittent renewables such as wind and solar, successive British governments have been unaccountably blind to this need. Today in Britain a coalition of energy academics and industry figures including two former chief scientific advisors, National Grid, DNOs, renewables companies and green NGOs such as Friends of the Earth are all saying that Britain has insufficient storage. Meanwhile the government has failed to show that it either understands the immediacy of the problems caused by insufficient storage, or that it has any clue how much new storage will be required as renewables increase through 2020, 2025 and onwards. In contrast, Portugal, one of a number of countries whose governments have shown more foresight, is planning to deploy 1GW of new storage for every 3.5GW of renewables. By the Portuguese formula Britain is currently 2GW short of the storage it needs and will be more than 6GW short by 2020. With insufficient ability to store excess production by renewables when demand is low, then release it when demand is high or the wind ceases to blow, Britain’s grid is needlessly volatile and exposed to the risk of blackouts. Energy bill payers might justifiably expect the UK to have a less wasteful, more joined-up energy strategy, but the government’s sole response so far has been to pay wind farms to shut down when winds are high, and pay owners of previously mothballed thermal power stations to hold them ready for action when the wind drops. Outside the UK, pumped hydro storage – as harnessed by Dinorwig – remains the dominant technology. Used to provide more than 90 per cent of the world’s storage needs, it is time-proven and able to scale to a size large enough to be of use in balancing country-wide electricity grids. In the UK though, there has been an assumption that no sites remain in the British Isles where further pumped hydro could be built. QBC, a Cambridge-based storage developer is proving that assumption wrong. It has carried out a UK-wide GIS-based survey and found suitable sites for some 15GW of pumped hydro. Not all locations are what may be thought of as conventional. Some will re-purpose brownfield land while others will use coastal features and sea water. Others still will use drinking water. The first of these schemes is due to begin operating by 2019. Sited on the southern shore of the same lake that neighbours Dinorwig, the 600MWh Glyn Rhonwy scheme is using disused slate quarries – rather than exploiting natural geographical features such as the cwm that Dinorwig uses as its top reservoir. QBC has formed a subsidiary company, Snowdonia Pumped Hydro, to take the scheme through to operation. With planning permission granted in late 2013 and ground investigations now underway, construction companies could be invited to tender for the build before the end of 2015. The site of the Glyn Rhonwy Pumped Storage facility is on the slopes of Cefn-Du, a hill that rises from the south bank of Llyn Padarn. Cefn-du was used by Marconi in his experiments with long distance radio communication and was from where in 1918 the first radio transmission from the UK to Australia was made. Open pit slate mining had begun on its northern face overlooking the lake in around 1840, but by 1930 all slate quarrying had ceased. Ninety years of dangerous and backbreaking work by the men of the area had left the hillside scarred by multiple quarries and slate tips. Used during World War Two as a site for explosives storage and disposal, it was subsequently handed by the British Ministry of Defence to Gwynedd Council. In 1998 the council began leveling the lower ground and building access roads to create a site suitable for light industry. No applicants for the building plots came forward and there followed a decade of inactivity punctuated by ultimately fruitless development proposals. QBC approached the council with the idea for a pumped storage development whose primary features were a repurposing of the two largest quarries into storage lagoons, and the construction of an associated hydro power station on part of the lower ground of the site. Council members on the specially formed Glyn Rhonwy Working Group saw that the proposal would not only create valuable full time jobs for the town of Llanberis, but also provide a long-lived source of rates revenues as well as potentially act as a catalyst for the long-hoped for occupation of the industrial site. QBC was invited to design a scheme and chose to work in partnership with civil engineering company Aecom whose track record includes the design of hydroelectric schemes and power stations around the world. Cadw, the Welsh government’s guardian of historic sites, Natural Resources Wales (formerly the Environment Agency Wales) and Gwynedd Council itself were involved closely in the process with the aim of achieving a visually unobtrusive design that met with maximum approval from key stakeholders. The topmost quarry, Chwarel Fawr, like its lower counterpart Glyn Rhonwy, is typically steep sided. 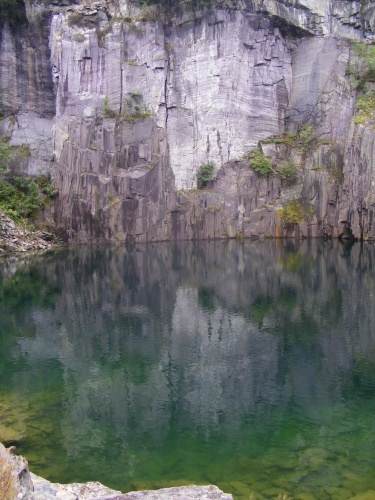 One of the earliest construction tasks will therefore be to reprofile the quarry sides, using rock anchors where necessary, to make them stable and able to withstand fluctuating water levels. Spoil from this process and elsewhere on the site will be used to create 20m high dams at the lip of each reservoir. The dams will be lined to make them impermeable and founded in the bedrock so that a grout curtain can be injected to prevent seepage underneath them. The finished reservoirs will each hold around one million cubic metres of water, with the topmost having a water depth of 60m. The height differential between lower and upper lagoons is 300m, requiring a penstock 1.5km long to transfer the water between the two. This is to be tunneled through the rock of Cefn-Du whose slopes are not regular. The tunnel’s effective depth below ground level will therefore fluctuate between 50 to 80m, plunging to 100m below ground level before entering the turbines. The 4m diameter tunnel will be steel lined towards the bottom of its run where pressures will be highest. The turbine house will be located on part of the lower ground that has been set aside by the council for light industry. It will be a shed-like building, faced in local slate to match other local buildings. It will stand over a 120m deep, 30m diameter concrete shaft, near the bottom of which will be sited the turbines and their associated generator sets. Spoil from the penstock tunnel boring, and the excavation of the turbine hall shaft, will mostly be recycled into the dam structures, with any excess tipped within the curtilage of the site. At the top pond location excess material will be used to form heaps mirroring those that are already a feature of the surrounding post-industrial landscape. In this way the need to remove any material from the site by road will be avoided. An overflow will link the lower dam to Llyn Padarn, as will a scour valve to allow the water level at the facility to be lowered if necessary. A small discrete pumping station will be buried adjacent to Llyn Padarn to enable the facility to be filled with water abstracted under license from the lake. Filling is expected to take around 12 months and will begin as soon as the lower reservoir has been completed. Because the upper reservoir is being formed from an existing quarry that is narrow and deep, rather than being the ideal shallow and wide saucer shape that would be excavated on a greenfield build, the head will reduce rapidly as the lagoon empties. Water pressure at the turbine house will therefore tail off over the six-hour run-time of the facility, requiring the flow to be throttled in order to deliver a stable output. Another notable feature is that there will be no surge pond or surge shaft to mitigate against equipment damage by negative pressure waves. Instead, the turbines buried some 80m below ground level will be at sufficient depth to create a pre-pressurised system in which return pressure waves never reach such a low level to cause equipment damage. The two 49.9MW turbines will be reversible Francis configuration with single impellers, able to both pump and generate. Encased in mass concrete they will be configured so that one can be maintained while its partner is operating. The developer has requested that the District Network Operator connects the facility to the local grid 8km away at Pentir by buried cable, rather than overhead lines. Pumped Storage charges up on off-peak electricity, but is not 100 per cent efficient at recovering the electricity used. A modern plant can expect to achieve a cycle efficiency of 80 per cent; meaning for every five units of energy purchased, four can be returned for sale. The breakeven point can be calculated by taking the cost of off-peak electricity and applying the efficiency loss and operational costs. Because the breakeven price tracks the cost of electricity, and because the price of electricity tracks the price of fossil fuel, pumped storage automatically hedges against any peaks or troughs in fuel prices. Inflation is also correlated to energy prices, so pumped storage also hedges against inflation risks. With wholesale gas prices currently around £22/MWh a modern Open Cycle Gas Turbine (OCGT) has a breakeven price (before OpEx) of £55/MWh. Combined Cycle Gas Turbines (CCGT) are much slower reacting than OCGT, but are more efficient, yielding a breakeven price (before OpEx) of £38/MWh. Despite the absence of substantive government encouragement for pumped storage the Glyn Rhonwy scheme will have a comparable breakeven price to gas generation fleet that is slower to start up and shut down, and less reliable too. In other words it will be more useful as a grid balancing tool than a gas power station, but cost about the same. The numbers stack up favourably for Glyn Rhonwy because the re-purposing of existing quarries means the cost of major excavation and spoil removal works is avoided. At a development cost of £160m, and with an output of 600MWh, investment payback will be achieved within 15 to 20 years, while carbon payback will be achieved within just six to nine months. Grid-scale storage like that at Glyn Rhowny will become increasingly valuable to Britain because of the volatility of renewables. Wind often blows hard at times of low demand – often at night. National Grid is already paying the operators of Britain’s existing pumped storage sites to soak up excess power at such times. The frequency of these events, and of minute-by-minute fluctuations during daylight hours, will only increase as the percentage of renewables continues to grow – increasing the need for the services that storage provides. SPH anticipates that the Glyn Rhonwy facility will operate a hybrid commercial model combining simple day-night arbitrage with active trading. Glyn Rhonwy will be buying electricity – or being paid to absorb it – at nighttime when it is generally cheaper, then regenerating it for sale at a higher price during the morning and evening peaks. It will also sell short bursts of power, and short duration absorption services into the balancing mechanism, the tool used by National Grid to help it balance supply against demand. With the economic balance surrounding pumped storage becoming inexorably more favourable over the coming 15 years renewables companies will likely look to add storage as a complement to their windmill or solar fleets. This will enable them to increase the accuracy of their output by soaking up peaks in generation and smoothing out troughs. Pumped storage used in this way to leverage a generator’s other assets can be expected to improve returns across a whole generation portfolio. In Europe they are having problems with the economics of pumped storage. The solar power from Germany floods the markets in the middle of the day lowering the amount of energy that the pumped storage suppliers can sell at peak price. Storage is necessary to deal with the intermittency of the renewables and so should be included and subsidized as part of a complete energy supply system. If you calculate a complete financial and energy balance for solar and wind including the cost (financial and carbon) of building the storage systems and the losses (circa 20%) I suspect that there will be very little if any real benefit. Traditionally, load shifting can barely justify the building of PS in the UK. Renewables might change that, but then Renewables also slice and dice baseload and may have interesting effects on hour by hour energy prices. We’re going to need a lot more than 3 GW of PS to mitigate intermittency, and in terms of storage, perhaps as much as 150 GWh for a 10 GW wind fleet. That’s a big energy storage target. Guys, you have probably just made the perfect case for Smart Grid. Smart Grid is beginning to happen now, at least in Germany. But if you don’t like Smart Grid, there is liquid nitrogen storage (I confess an interest here, my company is No. 3 worldwide in LIN). We are all interested in engineering issues here and as such, the operating efficiency of Pumped Storage would seem to me a vital piece of information. Why is this not mentioned in the article? “Pumped Storage charges up on off-peak electricity, but is not 100 per cent efficient at recovering the electricity used. There’s lots of variables, but it should be in the 75-80% ish area !! I am the author of the article and managing director of Quarry Battery Company. Roger B raises the interesting matter of the German experience where the output of solar is undermining the day/night arbitrage business model of storage. Germany has far more storage against peak demand than does the UK, and Germany is better interconnected so its system operator has alternative ways of mitigating the second-by-second and minute-by minute volatility and longer duration intermittency of renewables. In comparison the UK has a lower installed storage base against peak demand and is less interconnected. New grid-scale storage in the UK will operate a hybrid commercial model in which the trading of frequency and fast reserve services in the balancing market play a major role, alongside load shifting. As the percentage of renewables grows grid volatility and intermittency will only further increase. At the moment, The DECC’s approach to mitigating volatility and intermittency is to subsidise back-up thermal generation via the Capacity Market. While this may be a stop-gap that allows the UK to hit 2020 climate change targets it is hardly the most economic low-carbon solution. Indeed it actually undermines the third leg of The DECC’s ‘trilemma’ – that of carbon reduction. By going all out for renewables without thinking about storage as their natural partner the government created a capacity crisis that it now looks to the sticking plaster of the CM to resolve. We are at risk of overbuilding expensive offshore wind and then curtailing the output, while using inefficient oil and gas plant to plug the gaps in supply. New storage would avoid the building of more wind than we need, and avoid the capex and carbon costs of the fossil backup too. At QBC we don’t think Britain should build unlimited storage – there clearly needs to be a balance struck between carbon and security of supply on the one hand, and the price of storage on the other. Neither do we see PHES like our Glyn Rhonwy scheme as the complete answer to Britain’s storage needs. It’s the only proven grid-scale technology, is currently the cheapest, and can deliver a huge amount of grunt at very short notice, but other storage technologies yet to be deployed at scale promise complementary abilities that could see them deployed at different levels in the grid to do different jobs. Do we believe subsidies for storage are necessary? We do not. What’s required is an amended market framework that makes the true costs and benefits of the UK’s low carbon options visible to all. Storage is not generation, yet is currently treated as such by the market (and by the banks). Storage is infrastructure, like interconnectors, and should be recognised as such by government policy. A further catalyst would be for the Treasury to underwrite the development finance of new storage, just as it does for many infrastructure projects. This powerful confidence-building measure would drive down the cost of borrowing and together with the market changes enable the UK to achieve the most cost-effective low carbon grid. World’s biggest-ever pumped-storage hydro-scheme, for Scotland? 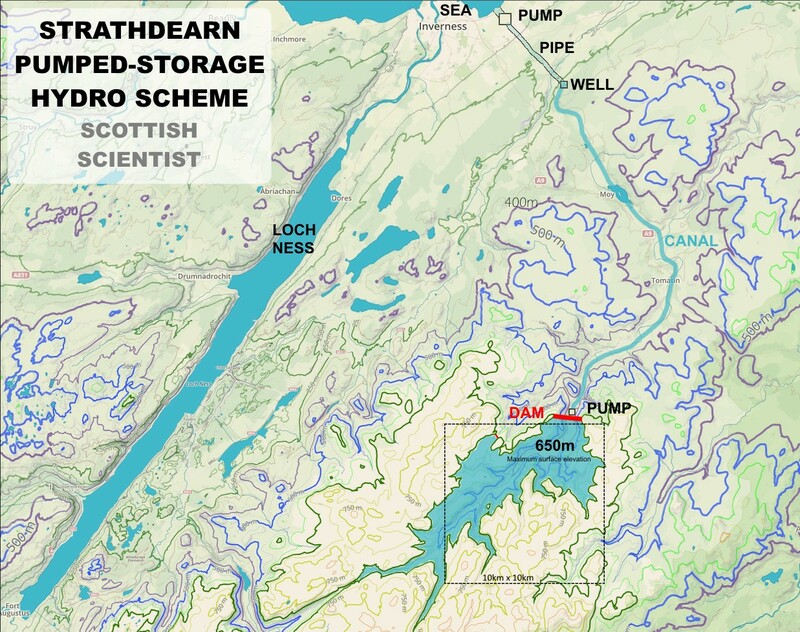 The map shows how and where the biggest-ever pumped-storage hydro-scheme could be built – Strathdearn in the Scottish Highlands. The scheme requires a massive dam about 300 metres high and 2,000 metres long to impound billions of metres-cubed of water in the upper glen of the River Findhorn. The surface elevation of the reservoir so impounded would be as much as 650 metres when full and the surface area would be as much as 40 square-kilometres. There would need to be two pumping stations at different locations – one by the sea at Inverness which pumps sea-water uphill via a pressurised pipe to 350 metres of elevation to a water well head which feeds an unpressurised canal in which water flows to and from the other pumping station at the base of the dam which pumps water up into the reservoir impounded by the dam. The potential energy which could be stored by such a scheme is colossal – thousands of Gigawatt-hours – a minimum of 100 GigaWatt-days, perhaps 200 GW-days or more. This represents enough energy-storage capacity to serve all of Britain’s electrical grid storage needs for backing-up and balancing intermittent renewable-energy electricity generators, such as wind turbines and solar photovoltaic arrays for the foreseeable future. The geography of Scotland – the land of the mountain and the flood – is ideal for siting pumped-storage hydro schemes to serve a European energy network infrastructure, with benefits for Scots, Britons and Europeans alike. 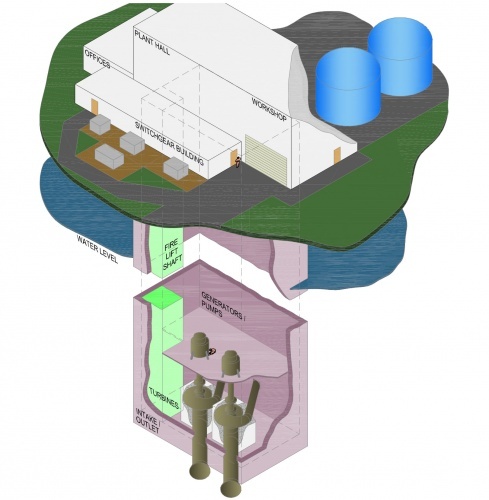 What does pumped storage do to reduce emissions from petrol and diesel engined vehicles? Answer – nothing. While I have nothing but admiration for Dave Holmes and all the dedicated entrepreneurs and engineers attempting to build and run our modern industrial nation, what he describes above is essentially the mother of all market failures. A defunct/discredited ideology has put in place a dysfunctional framework for electricity generation and distribution. This artificial construct can’t deliver the necessary infrastructure. There’s no market discipline here and nothing to attract the required investment (especially in R&D), aside from price guarantees which bleed the consumer. Above all, unworkable legislation has been set in stone, such as the definition of energy storage as ‘generation’ and laws which preclude National Grid from working in that arena! This is insane. In 2009, I put forward a radical solution for energy storage to NG’s ‘Operating2020’ consultation, but they can point to the law to excuse themselves from even engaging in a feasibility study. Put simply, my proposal was to store renewable energy before-generator. This stands conventional principles on their head, through the simple expedient of designing off-shore wind/wave and tidal turbines to pump water, instead of generating electricity with each individual installation. Energy storage is thus integral to generation and becomes the responsibility of the generators, who will benefit directly because they can sell their electricity at top prices to meet demand. This approach tackles the problem from both ends. It cuts the massive capex of building an over-capacity of renewable generation and delivers absolute control of the supply side, which is a far superior solution to both electricity storage and demand side response. Let’s just do it. I have much sympathy with the comments from Michael Brooks. The elimination of emissions from vehicles in cities should be a priority matter along with other serious pollutants. However, pumped storage is needed in the real world as matching of intermittent generation and demand is far beyond the smart grid type concepts. In my view we need pumped storage and hydro power to be able to generate about 5 GW and store about 10 GWh to ensure security of supply for the future and match the intermittency of our wind and solar generators. Of course the elephant in the room remains carbon dioxide, that most maligned and innocent of man’s by-products. While engineers and scientist become increasingly sceptical about the whole AGW farce, politicians and broadcasters remain convinced that the “Science is settled” and squander the worlds resources to save us from an imagined Armageddon. Professor Phil Taylor would hit the nail on the head, except for his careless confusion of ‘electricity’ with ‘energy’. When it comes to storage, those two are as different as chalk and cheese. Electricity storage shouldn’t be seen as a ‘service’ and energy storage must be treated as an essential, integral part of renewables generation. This is where the EMR proved to be a spectacular failure, as Labour MP Alan Whitehead predicted they would be. There is no ‘market’ in any true sense of the word and there never will be. The Labour Shadow Cabinet should know of the problems and would have been informed of the solutions, if my MP forwarded our correspondence on the subject in March last year. The Green Party also have the same information in their hands. It’s not “convoluted”. The electricity ‘market’ is irredeemably dysfunctional. That being the case; abandon all hope. . . . I have noticed that large tunnels create a constant and if designed correctly, tremendous amount of suction vacuum. If built with turbines in them,they would not need the wnd to blow, and would constantly provide tons of power. Maybe the tunnel for this project could incorporate such an idea? Forty years ago I worked on the completion of Brenig Dam in Denbighshire, probably one of the last dams to be built in the UK. New reservoirs generate a long lead in planning process. Some 20 years ago I suggested to my MP multipurpose use of the many (perhaps 100) existing reservoirs built in series in the UK uplands as well as tarns, quarries and lakes for pumped storage. These main assets are already sunk costs. At last the idea is being taken up at Glyn Rhonwy and I congratulate the planners and designers. In the 1970’s following the dams and reservoir safety act many young civil/hydraulic and geotechnical engineers cut their teeth making such structures safe. A program of modifying such water storages for PHP could do the same and provide stimulating work for British Engineers rather than employing French ones to design the white elephant that will be Hinkley Point C.
Every private consumer should be supplied with a house/flat re-setable main cut-out rated at 40 Amps max. not the 100 Amp fuses that are now installed. That would reduce consumption. Why should people have 10kW electric showers installed in their homes and huge cooking ranges. Economy of use is the overall answer to the problem. We are just using too many electrical items in our homes.